Contributor: All content & pictures provided by contributor Lin Sutherland – owner of Onion Creek Ranch in Austin, Texas. Thank you Lin! Mr. Peter Heyne, owner of Heyne Ranch. Photo provided by Lin Sutherland. Heyne Ranch Location: Southeast Texas, slightly south and west of Houston. Website: None at this time. Directions: Look for a Big sign on front of the drive. Please note, the ranch address is not exact on Google Maps. The best thing to do is Google Glen Flora. The ranch is one mile south on 960, just over the Colorado bridge, on the left. Call Peter Heyne if you have any questions or problems: 713-504-3141. Hours: By appointment only. This is a private ranch, you need to make arrangements before showing up. Dogs: Dogs are allowed if well behaved and under control. 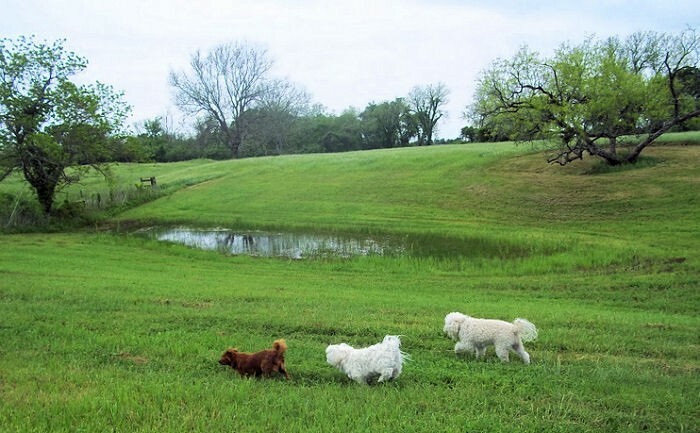 Lin’s puppies, having a blast at Heyne Ranch. Photo provided by Lin Sutherland. Fees: Fees are subject to change, please ask the owner, Mr. Heyne, for current rates. Day Riders: $20 per person for day riding (when not camping but only riding for the day) or $15 for day riding that is 4 hours or less. Farm House Rental: $125 a night. Guest ranch house for rent when available. Photo provided by Lin Sutherland. Ranch House: The ranch house has electricity, running water, central heat/air. This home is located in a Beautiful setting. Big cottonwood and sycamore trees overlook the 1920’s farmhouse, surrounded by a large, trimmed yard. An old barn sits nearby. The house is a two bedroom one bath facility. It can sleep five (two full sized beds and a fold out couch). A new refrigerator and stove is provided. Centrally heated and air-conditioned, the house is comfortable and pleasant, with old ranch photos and books. 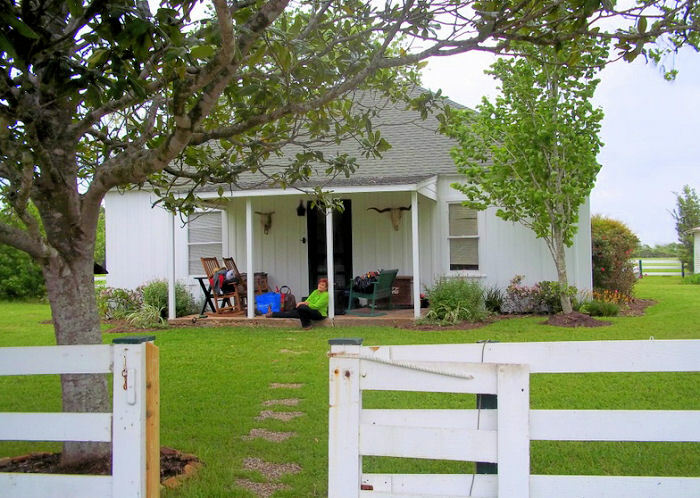 The front porch, complete with rocking chairs, is a perfect spot for wine and conversations. Cost: $125 a night. 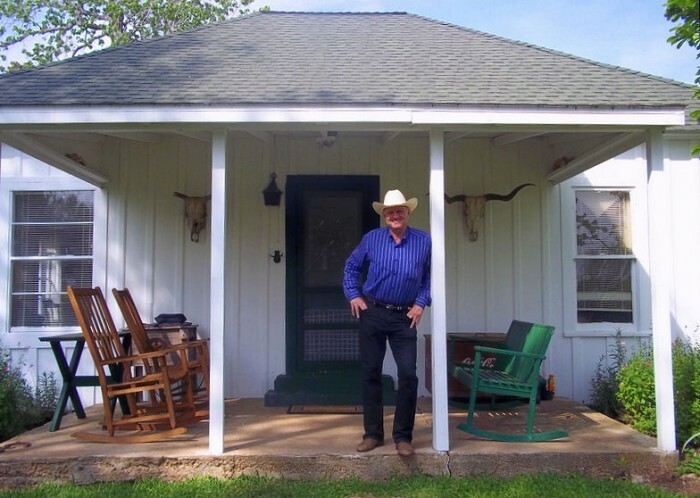 The ranch house is rented on a limited basis when Mr. Hayne is not using it. Bathhouse: There is a nice newly built bathhouse with running water, showers, toilets, and heat/air. Bathhouse with air & heat! Photo provided by Lin Sutherland. Pens – Good pipe pens (full of spring grass), two water troughs in the camping area. A hose and faucet are available for washing up. Owner requests you muck out your own area if needed. Camping: I saw no trailer electrical hookups but understand Mr. Heyne is working on that. For now it appears to be “dry camping,” but it’s under a large set of deep-shade trees near the pens. You are welcome to run your generator. Heyne Ranch barn. Photo provided by Lin Sutherland. Mileage: Approximately 10 miles of trail. Map: Provided by the Ranch. 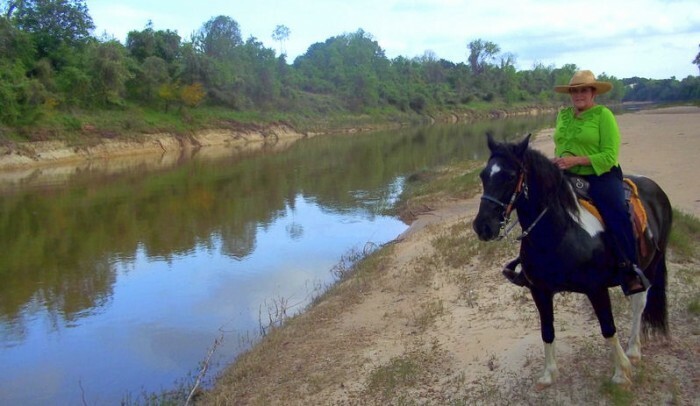 Trails/Terrain: This is a 400 acre ranch with 10 miles of trails. The 10 mile estimate is word from the owner. It seems about right. There are few gates to go through. Existing gates have horseback friendly openers. The trails were mowed when I was there. Shoes are not required. The soil is basically sandy. It’s solid, soft and mostly grassy footing. There is cattle/longhorn on the property. The River: Two river trails are gorgeous with winding trails through the trees. Big plus: Large sandy beach on the river. Owner suggests not entering the river by horseback as certain spots seem to have quick sand. Enjoying the Colorado River at Heyne Ranch. Photo provided by Lin Sutherland. Coggins: A current Coggins is required. Pests: BUG SPRAY HIGHLY RECOMMENDED. There can be sudden gnat invasions so DO NOT FORGET your bug spray both for you and your horse. It’s southeast Texas and on a river. A fly mask is also a good idea. Lin Sutherland at Heyne Ranch, April 2015. Photo provided by Lin. 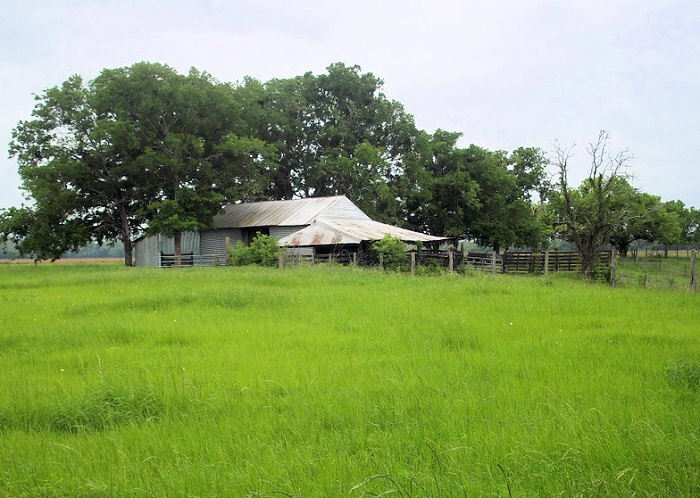 Heyne Ranch is an old private ranch in Southeast Texas that offers 10 miles of grassy, no-rock trails through scenic woods, farmland and rolling pastures. The land lies along the Colorado River and includes shaded parking, water troughs and pens. Peter Heyne, the owner, has opened the ranch to trail riders and overnight campers. He’s recently built a nice new bathroom/shower house that’s heated and air conditioned. The old farmhouse on the place is available for rent on a limited basis. Check with the owner for availability. 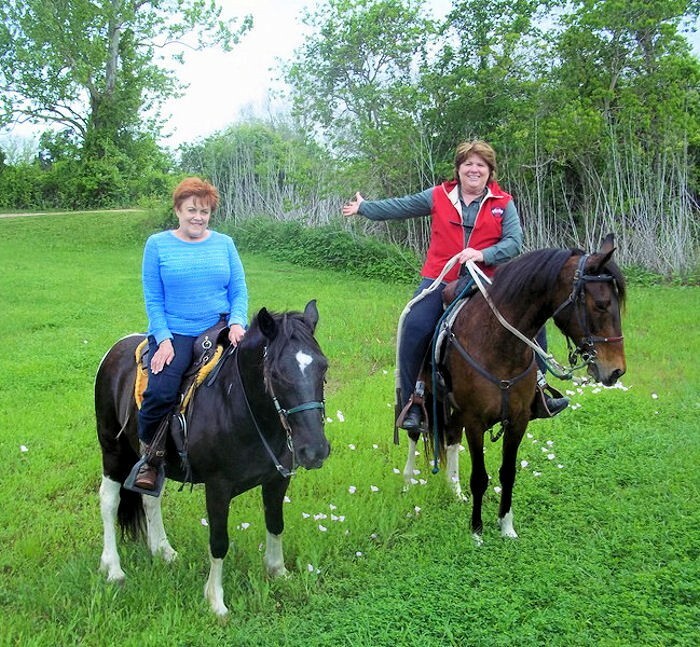 We took our two gaited horses to Heyne Ranch and it was perfect for them. The trails at the ranch are maintained by frequent mowing. We liked the trails that wind through the woods along the Colorado River and the open cantering trails through the fields where we could really move out. 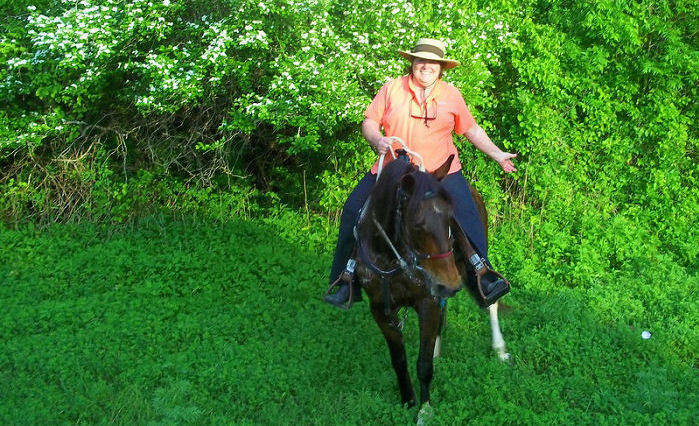 I also loved cantering on the smooth, long dirt road through the cultivated corn and cotton fields. Our horses are barefoot and never had a problem since rocks and tough terrain is virtually nonexistent on the ranch. At Heyne Ranch. Photo provided by Lin Sutherland. In Summary: I loved riding this ranch. I found I could really get up and go or just plod along and enjoy the scenery. For endurance riders, the trails do form a loop so you could do two loops with only two gates to open. There is one gas pipeline bridge you have to go under, but the owner has put in a go-around if your horse is wary of it. Our horses had no problem with it.